This is a one-day project for Marta Hackathon held by Atlanta Marta (Metropolitan Atlanta Rapid Transit Authority). The main topic was SmartCity+IoT, where participants sought for creative solutions to enhance ridership by implementing IoT or big data from sensors. 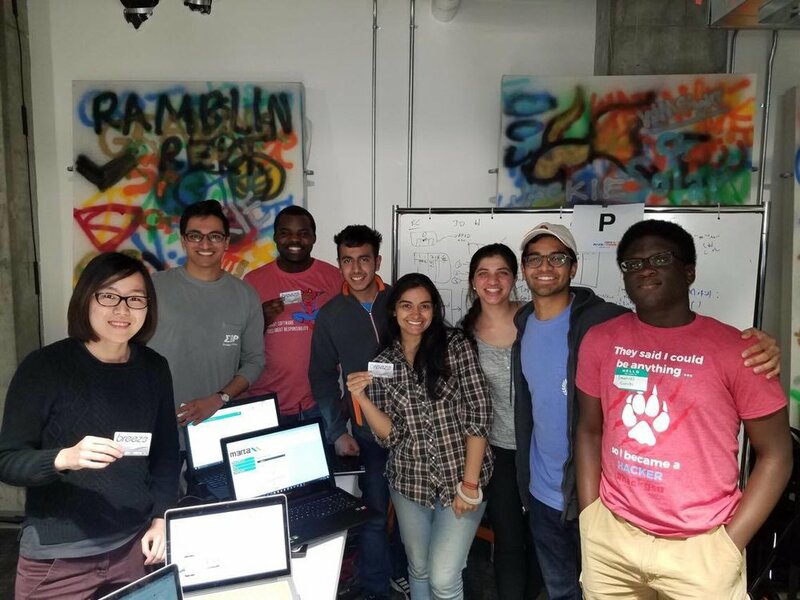 We hacked on the topic of Safe Marta and came up with a thorough passenger experience to increase rider confidence while traveling. The ecosystem we designed combined an app, web portal, automated text messaging and hardware RFID sensors to talk to a centralized database, which is also an open data resource to the public. Our team was formed at the event, with designers and developers who were all students. We came up with the ideas together, dividing the works into hardware prototyping, database & web portal developing, open data engine developing, and app prototyping. The final prototype demonstrated a thorough rider journey interacting with all touchpoints and presented how the overall service will contribute to a safer riding experience. We started from a discussion about individual thoughts on what safety issues there are for Marta, where do we feel unsafe, and what elements or existing resources can help to increase safety. As we moved on, we have taken into consideration the existing Marta See & Say App, the usage of Breeze Card, the concept of crowdsourcing report and riding companion, and most importantly, the interaction design to easily report emergency while in danger. Under either situation the passenger couldn't really ask for help in time through the app. Issues like privacy concern or false alert were also taken care of by our design of "Checking in when entering a train." When registering on the Safe Marta App, the personal information is kept private, and the user's location will only be visible to the riding companions when he is on Marta train or when there is an emergency reported on his train (on the user's choice). All the user needs to do is to tap at the compartment's door when entering the train, and the card number is automatically tight to the specific train and compartment. When the user reports an emergency, other passengers in the same compartment will be alerted through SMS. This mechanism alerts other passengers to the emergency and avoid fault alert. After the emergency is confirmed by at least one passenger, an alert will then be sent to all passengers' pre-registered riding companions and Marta Authority, which provide instant help from the authority and passengers' close contacts. Through the conversation with Marta riders, the most concern about riding Marta alone, especially for women and students, was the feeling of being unsafe in the unpredictable environment. Even the actual criminal events happening on Marta isn't that noticeable, the unsafe feeling will amplify the perception of danger and reduce the riding willing. By designing this Safe Marta system, we hope to increase rider confidence with easy access to instant help and notice from crowdsourcing report. One judge for Marta Hackathon actually confirmed her increase in confidence being able to track her kid's riding status and knowing she'll be notified immediately at the emergency. We believe this crowdsourcing ecosystem will increase rider confidence and provide a collaborative culture of mutual support in Marta transit community.